Home » Blog » Top Destinations: Disney » Find Crocodiles and Fossils in Animal Kingdom’s DinoLand, U.S.A.
Find Crocodiles and Fossils in Animal Kingdom’s DinoLand, U.S.A. 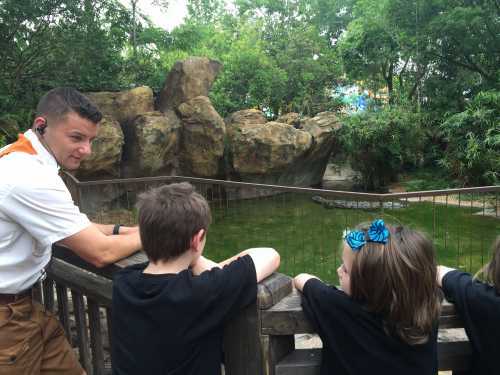 Situated on 400+ acres, Animal Kingdom showcases attractions, shows and live animals in four themed areas – Africa, Asia, Discovery Island, and DinoLand, U.S.A. Home to nearly 2,000 animals, the park also educates kids about the various animals found in each area. While you clearly won’t find live dinosaurs in DinoLand, park employees share fun facts about the crocodiles residing there, and there’s an abundance of dinosaur-themed attractions. DinoLand is especially suitable for young kids. Unlike Animal Kingdom’s other themed areas that have lush landscaping and are home to live critters, DinoLand, U.S.A. is a lively (and loud) dinosaur-themed entertainment area that looks, feels, and sounds like a carnival. Kids fascinated with all things dinosaurs will have fun in this whimsical part of Animal Kingdom that’s primarily geared for the younger set. However, there is one dark, thrilling dinosaur ride that appeals to older kids. Following are DinoLand’s top family-friendly attractions. As in other areas of Animal Kingdom, friendly and knowledgeable park employees do a good job dispensing fun facts. At the American Crocodile exhibit, kids learn that the basic difference between alligators and crocodiles are their nose. Alligators have a wide “U”-shaped, rounded snout, whereas crocodiles tend to have longer and more pointed “V”-shaped noses. Kids with an interested in learning more about Animal Kingdom’s critters and earning badges in the process can join the Wilderness Explorers program. The most thrilling ride (and my family’s favorite ride in DinoLand) is DINOSAUR. All-terrain vehicles blast through prehistoric forests filled with dinosaurs. The story centers on racing back in time to save the last dinosaur. It’s a dark, bumpy ride that moves fast, so it may not be suitable for young kids. Just outside the ride is a casting of a Tyrannosaurus Rex fossil. In addition to housing the Primeval Whirl spinning coaster and the more gentle TriceraTop Spin, this area is the site of Fossil Fun Games. The six carnival games require coupons (purchase at the souvenir shop) to play and win prizes. There’s also a curvy carnival mirror, a painted photo backdrop, a concession stand and a private picture booth. Parents can relax in a shaded seating area while young kids explore the play area’s slides, an archeological dig site, and climb on a jeep. Interactive exhibits include dinosaur footprints that make sounds. Located at the edge of DinoLand, this 40-minute live show is based on the animated film and is worth seeing. It also includes 14 original musical numbers. Cleverly camouflaged puppeteers bring the story of Nemo to life.